Originally produced by the Actors Theatre of Louisville in 1979, Crimes of the Heart, opened at the Manhattan Theatre Club in 1980, then moved to Broadway where it won the 1981 Pulitzer Prize for drama and the New York Drama Critics’ Award for best American play. A hit movie, screenplay by Ms. Henley, directed by Bruce Beresford and starring Diane Keaton, Jessica Lange, Sissy Spacek, and Sam Shepard, came out in 1986. Simultaneously hilarious and tragic, rich in its larger-than-life plot and character development, and a superb vehicle for three high-powered actresses, Crimes of the Heart has appeared many times over the past thirty years, on college campuses, in community and regional theaters, and on Broadway. McCarter Theatre’s current revival, playing through March 27 under the direction of Liesl Tommy, features three first-rate performers who carry this production and ensure an entertaining, rewarding evening. There’s Mary Bacon as oldest sister Lenny Magrath, dependable, lonely, and having a bad day, with her beloved horse Billy Boy just killed by lightning and her two sisters disgracing the family with their shocking behavior; Georgia Cohen as Meg, who’s back in town after a long string of bad days, ever since her singing career in Hollywood dried up and she spent some time in a psychiatric hospital; and Molly Camp as the spunky, outspoken Babe, who is guaranteed to make you feel better about the worst day of your life. She’s just out of jail on bail after shooting her husband. Beth Henleys Crimes of the Heart (1981) will run through March 27 at McCarters Matthews Theatre, 91 University Place in Princeton. Call (609) 258-2787 or visit www.mccarter.org for tickets and information. If you’re thinking these aren’t the sort of people you can identify with and this sordid subject matter isn’t likely to make you laugh — you’re probably wrong. Beth Henley has crafted her dialogue and plot superbly. The world she creates here is reminiscent of the South of Eudora Welty or Flannery O’Connor, or perhaps even the Russia of Anton Chekhov. She has crafted at least three extremely funny, outspoken, ultimately heart-warming characters, and these powerful actresses bring them to vivid life in a way that makes us care about them and their relationships with each other. The two hour forty-five minute running time does create a pace better suited to the South of forty years ago than to present-day New Jersey audiences, though the characters and their astonishing behaviors are consistently engaging and Ms. Liesl’s direction is focused and effective. Two intermissions unduly prolong the proceedings. Constantly, incongruously, juxtaposing the trivial and the momentous, the most petty and the most large-spirited, the realistic and the absurd, the play focuses on the lives of the three sisters as they relate their stories and attempt to move on from the shadow of their dark past and unfortunate present situations. “But Babe,” Meg urges her younger sister, “you’ve just got to talk to someone about all this. You just do …. Because it’s a human need. To talk about our lives. It’s an important human need.” And talk they do, in colorful detail, with humor and truth. Babe delivers the tale of her affair with a 15-year-old African-American boy, her husband’s abusive behavior, her unabashed shooting of her husband because she “didn’t like his looks,” and then, in detail, how she subsequently prepared a large pitcher of lemonade. Dustin Ingram as her awkward young lawyer Barnette Lloyd, who has had a crush on her ever since she sold him a pound cake at a church bazaar and a “personal vendetta” against her husband, creates an interesting, credible character and a valuable sounding board for Babe. Meg’s story, in addition to her exile from the family and her need to deceive Granddaddy with lies about her singing career, involves a long-time romance with Doc Porter (convincingly rendered here by Lucas Van Engen), who, since their last encounter in the midst of Hurricane Camille five years before, has married and sired two children. Lenny’s story, though less dramatic than her sisters’, is no less moving, as she begins the play by trying in vain to light her solitary birthday candle and ends the play on the next day with a happier celebration. In the meantime, she journeys through vicissitudes of loneliness, feelings of neglect, loss, resentment, shame, the rekindling of hope, and the possibility of romance. 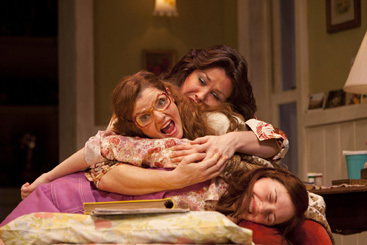 These three sisters are the heart of the play, interacting with the anger, bitterness, love, and deep understanding that only siblings can know and experience. Though strikingly different in so many ways, these three, embodied with admirable conviction and passion by Ms. Bacon, Ms. Cohen, and Ms. Camp, construct an intriguing and utterly believable family unit. Brenda Withers, full of focused energy and comic intensity, deftly portrays the character of the Magrath’s cousin, Chick Boyle. Perfectly coiffed, decked out in her tastelessly “stylish” brightly colored outfits, Chick, meddlesome and gossipy, invokes all the standards of small-town propriety as she provides a hilarious antagonist for her beleaguered Magrath cousins. Ms. Withers plays the society socialite-snobby cousin-villain role to perfection, from the moment she squeezes herself into her too-tight pantyhose in the opening scene until her final act exit, driven out by a newly empowered, broom-wielding Lenny. Andromache Chalfant’s unit set is impressive in scope, detail, and verisimilitude, depicting the huge Magrath kitchen, with doors suggesting further areas within and outside the house, and a portion of the roof and the second story exterior visible in the upper region of the proscenium arch. Appropriate, varied lighting by Ann G. Wrightson, and Marion Williams’ costumes, on target in reflecting and illuminating the idiosyncrasies of these six peculiar characters, also assist in creating this peculiar world of the Magrath family of Hazlehurst, Mississippi. Crimes of the Heart holds up well over the three decades since its creation. It may have absorbed all of Ms. Henley’s best stories from her Mississippi childhood, since her subsequent plays, despite some acclaim for The Miss Firecracker Contest (1984) and Ridiculous Fraud (a McCarter 2006 debut), have met with less success. The microcosm of Hazlehurst, Mississippi in the 1970s and the spirited dysfunctioning of the Magrath family possess a universality that still speaks powerfully to contemporary audiences. Plot and characters here may seem larger than life, but can’t we all remember an almost unbelievably, unbearably bad day? And haven’t we all contemplated, committed, witnessed, or fallen victim to our own “crimes of the heart”?